I am a fan of wholesome BBC baking show The Great British Bake Off, truly one of the highlights of my summer (and, since I tend to watch it on catch-up, autumn, too). In fact, I was slightly resentful of the Olympics for eating into my GBBO TV time (I think the bake-off started slightly later to take the Olympics into account). While watching the third season – which definitely featured some of my favourite characters (it was shocking to realise that James’ jumpers have numerous enthusiastic fans and not just, er, me), I idly thought that it would be afun project to bake all the challenges of the Great British Bake Off – seasons one, two, and three. And so here I am today. Well, not quite. The bakers have a couple of hours (usually three to five) to do each challenge, and they bake three recipes over a weekend. I’m not participating in the bake-off and I don’t have that kind of time, or capacity to eat that much baked goodness in one sitting, even. So my challenges will be more spread out, and though they won’t have the ticking-clock factor of the show, they will have the ticking-clock factor of my life. Looking over the challenges from the last three seasons, what I’m most struck by is the evolution of the show, from challenges that were simple and sweet and what a regular, good home-baker would have in their repertoire (a signature cake) to more complex creations that I can’t imagine the average home baker makes regularly – such as hidden design cakes. However, that’s for season three – I have dozens of recipes to get to before attempting that! I suppose in a way that evolution will be useful for me – I can practise and perhaps veen improve. And I do like a project. For anyone not familiar with the show, each episode is themed around a certain baked or dough-based good (cake, biscuits, choux pastry, etc). Bakers make three recipes: one, a signature bake, to showcase their personality (or to reflect a dish they regularly make – again, as requirements became more creative, this early requirement fell by the wayside a bit); second, a technical bake, where each baker makes the same recipe and they are judged against one another; and finally a showstopper bake. The showstopper should, as the name implies, be a celebratory showpiece. Hmm. We’ll see. So we start with this very simple challenge from the very first episode of the very first season of the Great British Bake-Off, the signature cake. A cake the bakers made regularly, a recipe close to heart, hearth, and home. All right then. I do make this cake, upon request, quite often. Probably more often than any other single cake recipe, actually. The sponge recipe is from Darina Allen’s Irish Traditional Cooking and uses Camp coffee essence. I sometimes add a little dissolved instant coffee as well to kick up the coffee factor. I am not a fan of traditional buttercream – too fatty, too much icing sugar – but I love Swiss meringue buttercream, which is silky and light and, because of the egg whites, less sweet for the large volume of icing produced. I will not lie and say that Swiss meringue buttercream is as easy as the ordinary kind. I have had it go wrong in numerous ways. It has been too liquid, but this was cured by a few bouts in the fridge before, during and after icing the cake.This time, it curdled, which was midly alarming, but I followed a tip I found online, which was to warm up about a quarter of the curdled buttercream until melted and then pour it into the icing while beating all the time. I was sceptical, but it did work. Look, this makes it sound like it’s not worth bothering about, but honestly the taste and texture of Swiss meringue buttercream make the extra effort worth it to me. And anyway, I never have icing sugar in the house and I always have caster sugar, so it actually saves me time and money as I don’t need to go to the shops to get some icing sugar. This is especially a bonus when it is cold. My cake decorating and the wonkiness of my cake layers would earn me some black marks from Paul and Mary, I’m sure. Oh well. (Also the poor lighting and my general amateur photography skills probably have anyone reading reeling away from their computers in horror). I did add some chocolate coffee beans which I’d bought in Belgium, which I don’t usually do. I quite liked the effect. Cream the butter till soft. Add sugar and beat until pale, light and fluffy. Whisk the eggs and add them bit by bit, beating well until fully incorporated with each addition. Sift together the flour and baking powder and stir gently into the cake mixture. Stir in the coffee essence. Spoon the mixture into the sandwich tins, dividing the batter evenly between them. Smooth the tops and bake for 30 minutes, or until a skewer comes out clean. Leave in the tins about 10 minutes, then turn out onto a wire rack and leave to cool (usually cool by the time I have cleaned up and then made the buttercream). Combine sugar, egg whites and salt in a heatproof bowl (I usually add the instant coffee granules here too, for them to dissolve in the egg whites. If you prefer not to follow my reckless path, just dissolve the instant coffee in a teaspoon or two of water and add at the end). Place over a pan of simmering water. The bowl should not be touching the water, and should not be immersed in it, but just be resting over it). Whisk constantly by hand until the mixture is warm and all the sugar is dissolved (I test this by rubbing a little of the mixture between my fingers). Cube by cube, add the butter, mixing well after each addition.Once all the butter has been added, beat on low for a few more minutes. Scrape down the bowl and beat for a few more minutes until the buttercream is completely smooth. If making this in advance, place it in an airtight container, and a little clingfilm on top wouldn’t go amiss either. Place one cake onto a plate, flat side up. Dollop a generous amount – about a quarter or third – of the buttercream and smooth out almost to the edge. Place the other cake, flat side down, on top. 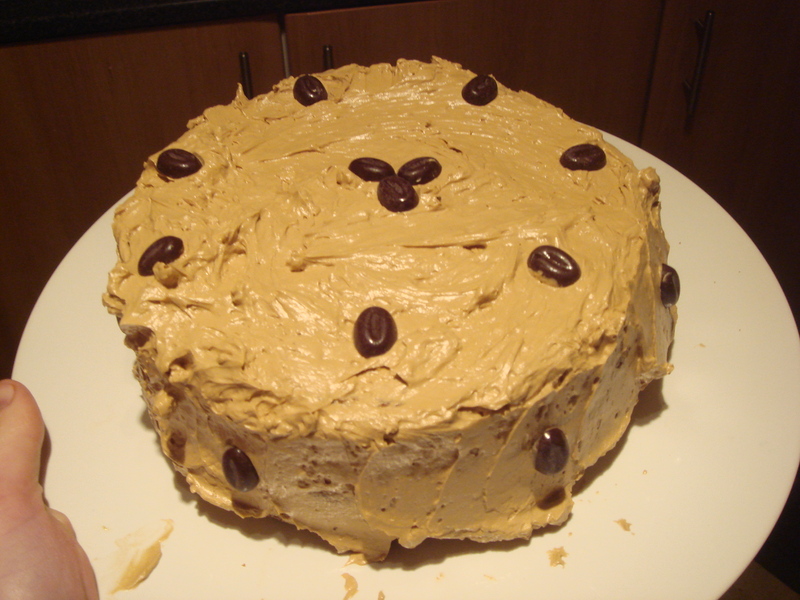 Apply the rest of the buttercream as evenly as possible around the cake, dragging it over the crumb coat. Look, I’m unable to make beautiful, even, perfectly smooth frosted cake: mine looks a bit swirly and rough. However, if you are more patient and dexterous than I, the frosting is soft enough to enable proper smoothing. At this point, decorate with whatever bits and pieces (chocolate coffee beans or real ones, dragees, etc) you have to hand, however you like.